This is a series of 17 theatrical short cartoons released between 1969 and 1971. It was produced at DePatie-Freleng Enterprises and released by United Artists. The plot was really simple, basically revolving around the unsuccessful attempts of a blue aardvark, named Aardvark, to catch and eat a red ant, called Charlie. I don’t know exactly when did it come to Brazil, but I surely watched it in the early 80’s. It probably stayed hidden in the back of our heads (my brother’s and mine) to influence the creation of Fireant and Anteater (by my brother and I in 1987). I never saw the cartoon again, but a quick search revealed that the characters reapeared in 1993, in a new incarnation of The Pink Panther, and again in 2010, in Pink Panther and Pals. The new versions kept the same basic plot. Ant first appeared in Ant #1 by Arcana Studios, a small independent company, in March 2004. 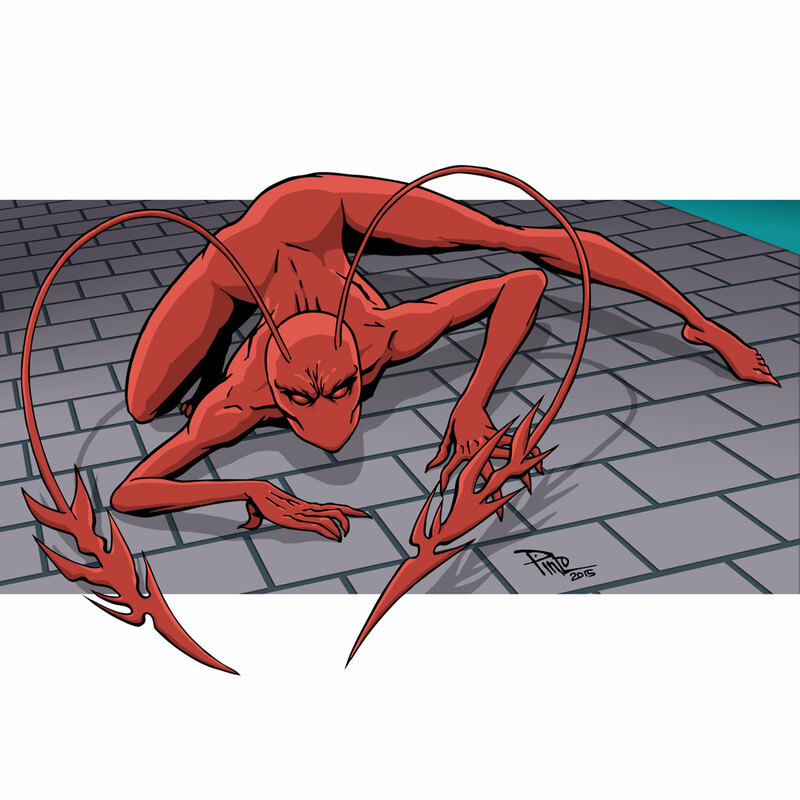 The creator and artist, Mario Gully, states the concept for the character appeared while he was incarcerated in 1996 for attempted armed robbery. He says that one day he was looking through a barred cell window and a tiny ant crawled in from the outside. 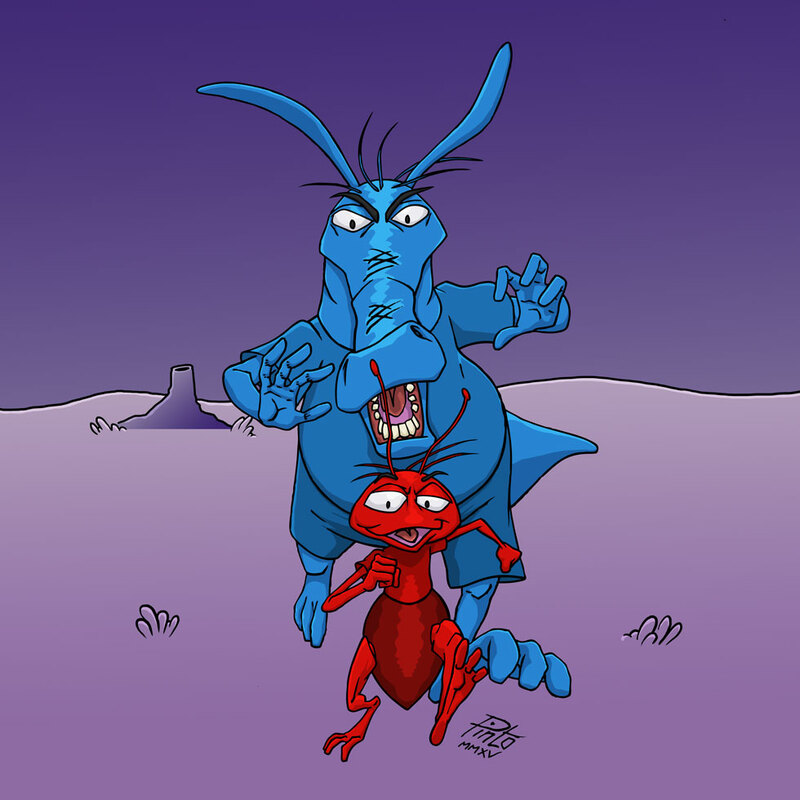 After the reasonable success of the first volume, with 4 issues, Ant moved to Image Comics for a second volume. It had an 11 issues run, featuring Spawn and Savage Dragon as co-stars. It then moved to Big City Comics for a third volume that never had all the planned issues published, leaving the story without a resolution. 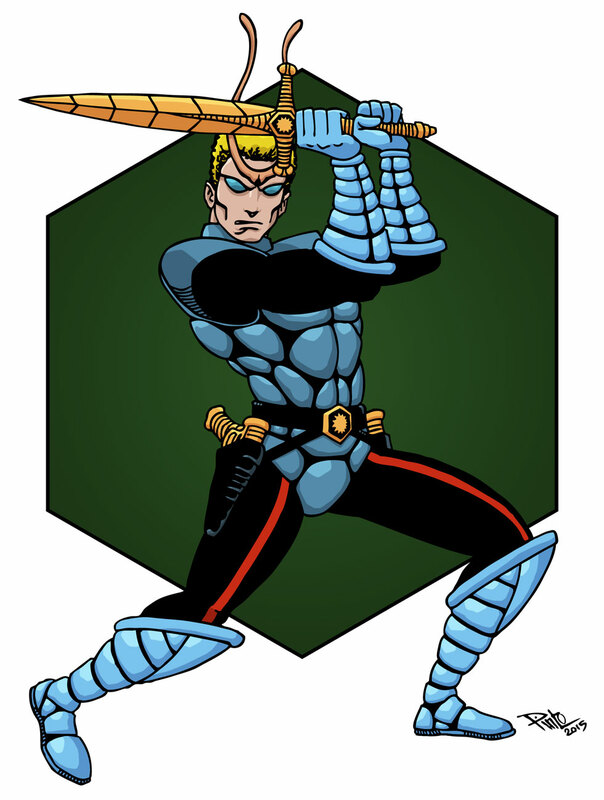 In 2012, Gully sold Ant to Erik Larsen (Savage Dragon). Larsen hired Gully to draw the story but, after some confusion, the project to finishing volume 2 was dropped… maybe for the best. Ant has enhanced speed and strenght. Her skin is covered by a red regenerative exoskeleton. Her antennaes give enhanced senses and can be used as deadly weapons. Her story? She is a little girl that dreams she is Ant, then she is a stripper that sprays herself with a red paint and becomes Ant, then… I’m really not sure. In the end I think the point was the sexploitation of the curvilineous character that actually looked to be a naked woman painted in red. Most of the covers for Ant titles would make Manara’s Spider Woman look like a coy girl. The Tick should not be in this list. A tick is an arachnid, not an insect, but let’s take him in because of his sidekick Arthur, who wears a white moth suit (often mistaken for a bunny because of the long ear-like antennae). It was created back in 1986 by Ben Edlund as a mascot to a newsletter. It moved fast from short stories on the newsletter to its own comic book in 1988. 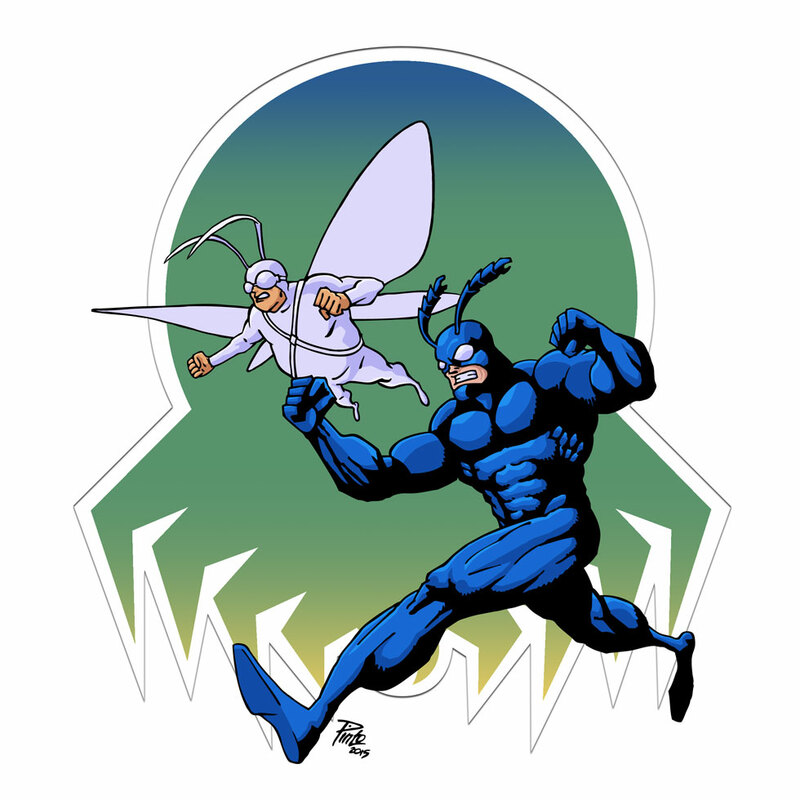 In 1994, Fox Network introduced The Tick as a Saturday morning cartoon series with 3 seasons. It soon appeared in brazilian cable TV, where I saw the character for the first time. In 2001 it became a live-action TV series, but that lasted only 9 episodes. The Tick is a parody of a superhero. He doesn’t seem to have any memory of a life before assuming the persona of The Tick. He has super strenght and leaps from building to building making a mess. His friend and sidekick, Arthur, uses a costume with wings that enable him to fly. In the TV show, he had a support cast made of parodies of famous heroes and vilains, such as Batman, Wonder Woman, Captain America, Aquaman and Galactus (who made The Tick his herald for a while). Sectaurs: Warriors of Symbion was a line of action figures released by Coleco in 1985 (in Brazil, it was released by Mimo). They had an animated mini-series (only 5 episodes) and Marvel Comics published an 8 issue limited series about them. I first learned about Sectaurs from a sticker album. And that made me want one action figure. The rest is history. In a planet called Symbion a genetic experiment goes wrong, resulting in a world where insects and arachnids grow to huge proportions. The inhabitants of that world, before human, were also affected and incorporated some characteristics of those creatures. They were tele-bonded to the giant insectoids and each had a special ability. More agile than a turtle, stronger than a mouse, nobler than a lettuce, his coat of arms is a heart… It’s the Crimson Grasshopper! 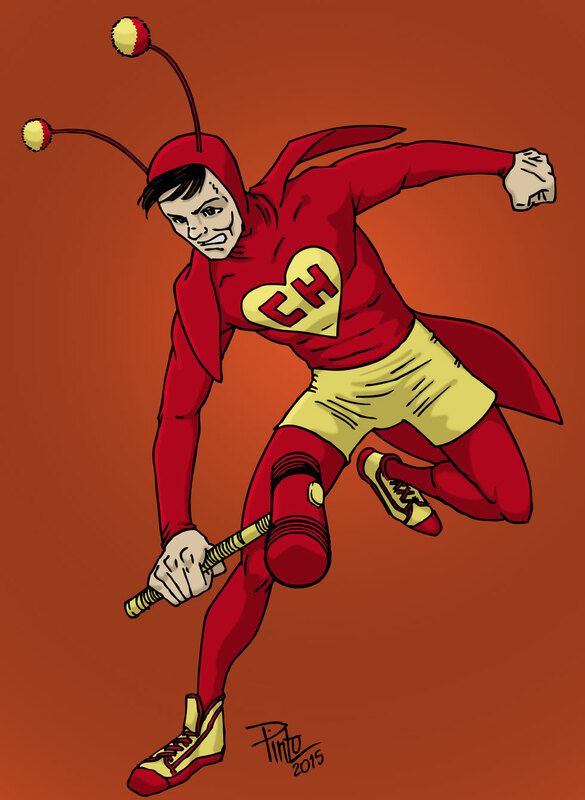 El Chapulín Colorado is a superhero parody created by Roberto Gómez Bolanõs (also known as Chespirito). It was part of the Mexican television comedy series El Chavo, that ran originally from 1971 to 1980 and had hundreds of episodes. The show aired across Latin America and Spain. It still does in Brazil, where the character is also known as Chapolin, Vermelhinho and Polegar Vermelho. For a long time (before the internet) I assumed that the CH on his chest standed for Cucaracha Hombre. But no, the CH (like the S on Superman or the first letter of any other superhero that use a letter for symbol) is a digraph that was treated as a single letter in spanish. It really stands for Chapulín, a kind of grasshopper commonly used for food in certain areas of Mexico. He had a set of super equipments/gadgets: Chipote Chillón (in Brazil known as Marreta Biônica, a red and yellow squeaky hammer that could allegedly pulverizes his enemies and return to his hand with a whistle), Antenitas de Vinil (Anteninhas de Vinil, antennae on the top of his hood that granted him the ability to detect criminals or danger, decode and translate languages and secret codes, and many other things), Pastillas de Chiquitolina (Pastilhas Encolhedoras, special pills that reduce the hero to 8 inches tall for around 10 minutes), La Chicharra Paralizadora (Corneta Paralisadora, a bicycle horn that could freeze any targeted person or object in the mid-air when sounded once, freeing the target when sounded twice). He had also some fighting skills, mostly similar to Mexican wrestling, but they were actually of little or no use whatsoever, considering his reduced strengh and extreme cowardice and clumsiness. I think his only real super power was the ability to appear out of thin air when anyone cried Oh! And now who will be able to help me? (in Brazil: Oh! E agora quem poderá me ajudar? ).